IMPORTANT INFORMATION: The Kingdom Calendar above reveals the pattern of how the prophetic counting days of Daniel and Revelation could line up. The way in which the counting periods align, as one interconnected whole, is verified by the precision in which they connect starting with the Purim Festival established in the book of Esther, Passover of Leviticus 23, and the annual Tisha B'Av Fast found in Zechariah chapters 7 and 8, and precisely ending three and one-half (3 1/2) years later at the Day of Atonement (Yom Kippur), along with the Feast of Trumpets (Rosh HaShanah) and Feast ot Tabernacles (Sukkot)--all from the Leviticus 23 Festivals established by Almighty God. It's interesting to note that the match would not be possible for three of those periods without the inclusion of the very small but all-important 3 1/2 days discovered in Revelation 11 and Daniel 9. The Kingdom Calendar represents events that could occur in the future. We serve an amazing God who is "declaring the end from the beginning, And from ancient times things that are not yet done, Saying, ‘My counsel shall stand, And I will do all My pleasure," (Isaiah 46:10). He will unseal and reveal the over 2,000 year old mysteries and visions through the means of His owning choosing, to make known His final work. Those events may follow The Kingdom Calendar exactly on Festival periods as shown, or it may only represent merely a "pattern" of fulfillment. Any attempt by humans to fully comprehend the plan of God will be lacking until the final days meet reality, and the Seventh Angel sounds (Revelation 10:7). Not all have been revealed, and so... daily trusting in Yeshua--Jesus, our LORD and Savior will still be our primary responsibility during the appointed times of the end and our counting journey to the Kingdom. Nonetheless, consider the evidence as you study the prophecies. First, no time chart comes close to the degree of verification illustrated by the Biblical facts, mathematics, historical connections and current events. This will become clearer, as the layers of evidence build upon one another. Second, no other chart employs every significant counting period in Daniel and Revelation; and third, having accounted for all the major timelines, no other chart aligns from beginning to end directly between the Biblical Festivals, celebrations and annual fasts, still observed/celebrated today by many Jews and a growing number of Gentiles, to prove its authenticity. As mentioned, if God follows His Festival pattern, the 1,290 counting days of Daniel 12:11 would begin at Purim, commemorative of Jewish survival despite Persian (Iranian) threats to destroy the Jews (which threats are bound to increase in the last days), and will end with the abomination being set up on the Temple Mount exactly 3 1/2 days before Yom Kippur (Day of Atonement). That exactness, by itself, would be inspiring. However, following the same pattern the reoccurring 1,260 counting days found seven times in the prophecies (Daniel 7:25; 12:7; and, Revelation 11:2; 11:3; 12:6; 12:14; 13:5--indicating 3 1/2 years to be the primary period of the end-times, would begin at Passover and also end exactly 3 1/2 days before Yom Kippur--the exact period the two witnesses (referred to as the two anointed ones--Zechariah 4:1-14) are martyred and will remain unburied in Jerusalem's streets according to Revelation 11:9-11 and Daniel 9:25-27. It's noteworthy to learn that Judaism teaches Elijah will arrive at Passover to announce redemption, the exact point the two witnesses are to begin their 1,260 day ministry as shown on The Kingdom Calendar. In addition to these two notable timelines, we discover the 2,300 evenings and mornings (sacrifices)--considered to be 1,150 counting days, which are associated with Satan and his army desecrating Heaven’s Sanctuary by war, with need to surrender the Sanctuary for an end-time courtroom judgment (Daniel 7:9-10; Daniel 8:9-14, 26; Revelation 12:7-9). This solemn 1,150 day counting period fits between Tisha B' Av and Yom Kippur—bracketed between two of the most significant and somber annual fasts in the Scriptures and in Judaism. In this regard, the Scriptures seem to indicate that while daily worship at the Western Wall and Temple Mount has been taken away, Satan’s army will also battle as the last days begin against Michael and His host of angels--reaching and desecrating the Temple in Heaven. However, after Satan is defeated an official review of Lucifer and the Man of Sin’s (Antichrist) evil activities will commence. This 1,150 day period will end near or on the Day of Atonement, when all accumulated sins were dealt with annually at Yom Kippur in the ancient Sanctuary services. Tisha B’Av is the fast of the 5th month referred to in Zechariah 7:3,5 and 8:19, which is still observed religiously, commemorating war and the desolation of Solomon’s Temple long ago by the Babylonians. The DAY of Atonement (Yom Kippur) is the holiest day of the year, and an annual fast occurs on this day of judgment to "afflict your soul" (Leviticus 16:29-31). Observant Jews fast and pray that God will “accept our repentance, forgive our sins, and seal our verdict” for life, and not for death. The Kingdom Calendar 2019-2022 above represents the most recent fulfillment watch period. Whether now or in the future, final events begin with a great shaking in Israel that will cause terrible devastation to Jerusalem, and will take away daily worship at the Western Wall and Temple Mount as the religious structures and the City collapses in devastation and ruin with loss of lives and property (Daniel 12:11). "Jesus left the Temple and was walking away when His disciples came up to Him to call His attention to its buildings. “Do you see all these things?” he asked. “Truly I tell you, not one stone here will be left on another; every one will be thrown down.” Matthew continues, "As Jesus was sitting on the Mount of Olives, the disciples came to Him privately. “Tell us,” they said, “when will this happen, and what will be the sign of Your coming and of the end of the age?” Jesus answered: “Watch out that no one deceives you. For many will come in My name [Christians; wolves in sheep's clothing], claiming, ‘I am the Messiah,’ and [yet] will deceive many. You will hear of wars and rumors of wars, but see to it that you are not alarmed. Such things must happen, but the end is still to come. Nation will rise against nation, and kingdom against kingdom. There will be famines and earthquakes in various places. All these are the beginning of birth pains." Many will come in the name of Jesus, advancing deceptive unscriptural views to the masses. Miracles, sights and sounds will hold higher value than "thus says the LORD". Conflict will escalate abruptly and without warning between the nations, initiating the end-time events Jesus foretold in Matthew 24 and the mysterious counting periods written in the Book of Truth (Daniel 10:21). In concert with the Jerusalem events, Middle-East war will escalate into a short but destructive global World War as we will begin counting the prophetic days of Daniel and Revelation, which will lead day by day to the return of Messiah and His Eternal Kingdom. The Western Wall, also known as the Wailing Wall and "Kotel", is the last standing remnant of the Second Temple, and this ancient 62-foot-tall limestone wall in Jerusalem’s Old City became the main focus of Jewish worship and prayer that continues today due to the Roman destruction in 70 A.D. Daily, thousands of Jews and Gentiles visit the Wall in reverence and awe; more than 10,000,000 visitors each year. However, a massive Israel/Jerusalem quaking at Purim will take away the “daily” worship at the Western Wall and Temple Mount. The loss of the Islamic Temple Mount structures and damaged Wall will immediately initiate the 1,290 and 1,335 day counting periods. As mentioned, at the same time we will see Middle-East turmoil quickly escalate into a catastrophic nuclear World War with global tragedies and fearful pandemonium, leading to the rise of Satan's Man of Sin and the beginning of the 1,260 day counting period, followed shortly after by the start date for the 1,150 days at Tisha B'Av. The 70 weeks (490 counting days) will also come into focus later during the counting periods. Gentile troops will be controlling and patrolling the most holy places of Jerusalem as foretold in Revelation 11:1-2 "Go and measure the temple of God and the altar, with its worshipers. But exclude the outer court; do not measure it, because it has been given to the Gentiles. They will trample on the holy city for 42 months" (1,260 days). Only after the three religions of Jerusalem (Judaism, Christianity and Islam) argue for two years over the explosive religious/political ramifications of how Jerusalem and Temple Mount will be rebuilt, will the decree be given to rebuild. The 70 weeks represent the final counting period specific to the nation of Israel: “Seventy weeks are determined for your people [Israel] and for your holy city [Jerusalem]," Daniel 9:24), which includes the decree to rebuild the earthquake/war torn and devastated Jerusalem (Daniel 9:24-27). While Jerusalem is protected by international forces, powers from the north will set their goal to conquer Israel: "Gog, the land of Magog, the chief prince of Meshech and Tubal... prophesy against him... In the latter years thou shalt come into the land [of Israel] that is brought back from the sword, and is gathered out of many people, against the mountains of Israel, which have been always waste: but it is brought forth out of the nations, and they shall dwell safely all of them [during the temporary peace brought about by Antichrist]. I will go up to the land of unwalled villages [which walls have fallen and are broken down]; I will go to them that are at rest, that dwell safely [through the protection of the Gentiles], all of them dwelling without walls, and having neither bars nor gates," which have been destroyed. "To take a spoil, and to take a prey; to turn thine hand upon the desolate places that are now inhabited, and upon the people that are gathered out of the nations, which have gotten cattle and goods, that dwell in the midst of the land," (Ezekiel 38:2, 8, 11, 12). At the end of the 1,290, 1,260, 1,150 and 490 counting days, Michael, the Seventh Angel will descend with a shout--the voice of the Archangel, and His thunderous ear-piercing declarations will reverberate around the globe as the planet shakes off its axis (1 Thessalonians 4:16; John 5;25). The martyred end-time saints will be raised along with the two witnesses to ascend to Heaven, while the great tribulation plagues against the rebellious will commence. Every one of the prophetic counting periods of The Kingdom Calendar will march to their conclusion on schedule with no further delay, based on Messiah’s sworn statement to His two witnesses—His “servants the prophets”—Moses and Elijah on the banks of the Tigris river: They were told, “It will be for a time, times and half a time [1,260 days]. When the power of the holy people has been finally broken, all these things will be completed.” (Daniel 12:7). The mystery of God will be accomplished. As I was standing on the bank of the great river, the Tigris, I looked up and there before me was [Michael--having come down from Heaven] a Man dressed in linen [priest garments], with a belt of fine gold from Uphaz around His waist. His body was like topaz, His face like lightning, His eyes like flaming torches, His arms and legs like the gleam of burnished bronze, and His voice like the sound of a multitude... At that time Michael, the Great Prince [Messiah, the Angel of the LORD] who protects your people, will arise" from His throne. "There will be a time of distress such as has not happened from the beginning of nations until then. But at that time your people—everyone whose name is found written in the book—will be delivered. Multitudes ["a great multitude that no one could count, from every nation, tribe, people and language," Revelation 7:9] who sleep in the dust of the earth will awake [in resurrection]... Then I, Daniel, looked, and there before me stood two others [Moses and Elijah, His two servants the prophets], one on this bank of the [Tigris] river and one on the opposite bank. One of them said to the Man clothed in linen [Michael, clothed in a High Priest's linen robe (Ezekiel 44:17-19; Hebrew 4:14; 8:1-2)], who was above the waters of the river, “How long will it be before these astonishing things are fulfilled?” The Man clothed in linen, who was above the waters of the river, lifted His right hand and His left hand toward heaven, and I heard Him swear by Him who lives forever [Genesis 22:15-18; Hebrews 6:13], saying, “It will be for a time, times and half a time. When the power of the holy people has been finally broken, all these things will be completed," Daniel 10:4-6; 12:1-3; 5-7. "Then I saw another Mighty Angel [Michael-Messiah, the Angel of the LORD] coming down from Heaven. He was robed in a cloud, with a rainbow above His head; His face was like the sun, and His legs were like fiery pillars. He was holding a little scroll, which lay open in His hand. He planted His right foot on the sea and His left foot on the land, and He gave a loud shout like the roar of a lion... Then the Angel [of the LORD] I had seen standing on the sea and on the land raised His right hand to heaven. And He swore by Him who lives for ever and ever, who created the heavens and all that is in them, the earth and all that is in it, and the sea and all that is in it, and said, “There will be no more delay! But in the days when [Michael] the Seventh Angel is about to sound His trumpet [to raise the great multitude that no man can count, from every nation, tribe, people and language], the mystery of God will be accomplished, just as He announced to His [two] servants the prophets" (Revelation 10:1-7) -- Moses and Elijah, on the banks of the Tigris River several hundred years earlier (Daniel 12:5). "And I will appoint my two witnesses, and they will prophesy for 1,260 days [time, times and half a time], clothed in sackcloth.” They are “the two olive trees” and the two lampstands, and “they stand before the LORD of the earth," (Revelation 11:3-4; Zechariah 4:11-14). "For the LORD Himself will come down from Heaven, with a loud command, with the voice of the Archangel" --Michael "and with the trumpet call of God, and the dead in Christ will rise first [in resurrection]. [Soon] after that, we who are still alive and are left [behind] will be caught up together with them in the clouds to meet the LORD in the air. And so we will be with the LORD forever," 1 Thessalonians 4:16-17. FOR DETAILS ABOUT THE 21 POINTS OF THE CALENDAR in BOOK FORMAT... ORDER The Kingdom Calendar: Divine Dates of End-time Disaster & Deliverance available in a 202 page 8X10" paperback edition at Amazon. This book takes you step by step through events of the final crisis and the 21 Points of The Kingdom Calendar, noting how the great worldwide troubles begin and end within the time allotted by God. Ecclesiastes 8:5-6 says, “a wise man’s heart discerns both time and judgment. Because to every purpose there is time and judgment." As noted, The Kingdom Calendar is the first end-time chart in which all the significant prophetic counting timelines (3 1/2 days; 490 days; 1,150 days, 1,260 days, 1,290 days and 1,335 days) revealed in the books of both Daniel and Revelation are included; not one is missing, including the 490 days found in Daniel 9--also known as 70 weeks (which, as is shown, represents 70 literal weeks--just as the Hebrew reads, about one year and four months). The time periods were first chronologically aligned into a chart in 1990 based on the study of the books of Daniel and Revelation and other prophecies, with no realization there was or could be a connection to the Biblical Festivals of Leviticus 23. Two years later, after learning more of the Festivals' importance to final events, it was discovered the charted timelines of Daniel and Revelation fit between the Biblical Festivals to the day over a typical three and a half year Festival period, using the commonly accepted Jewish calendar observed today and established by Hillel II around 359 C.E. (A.D.), well after the timelines in Daniel and Revelation were penned. Either I was incredibly lucky, or I had stumbled by God's grace across an ancient mystery. To better appreciate why the match between the prophetic timelines and the Festivals is significant, establishing the Calendar's authenticity, consider this: The Biblical Festivals are not stationary; as, for example a person's birthday, which annually always falls on the same day, or the Christian holiday of Christmas that is celebrated every year on December 25. The Festivals shift to different dates each year. For example, Passover. This annual Festival was observed on April 23, 2016, on April 11, 2017, March 20, 2018, and in 2019 on April 20th. This fluctuation on the Jewish Calendar is due to a complex lunar/solar Biblical Calendar. 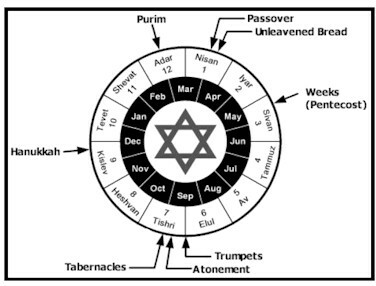 Just imagine the outer ring of Jewish Festivals on the graph below floats back and forth independently from the inner January--December Gregorian calendar ring; but in addition, the Festivals can also have varying days between them from year to year. At creation God said, “Let there be lights in the firmament of the heavens to divide the day from the night; and let them be for signs and seasons ["moedim"--Festivals], and for days and years," (Genesis 1:14). When Moses received instructions from Jehovah, the command in Deuteronomy 16:1 was to "observe the month of Abib, and keep the Passover." This made it necessary to become acquainted with the position of the sun; and, the command to offer sacrifices according to the "new moon" (2 Chronicles 2:4;8:13; Ezra 3:5) made it necessary to study the phases of the moon. However, today's modern Festival Holiday calendar culminates from debate, disagreements and adjustments through the course of Jewish history. According to Judaism, the observance calendar can be divided into three historical periods—the Biblical, the Talmudic, and the post-Talmudic--all effecting the timing of the annual Festival observations and celebrations. The study of astronomy is largely attributed to the need of fixing the dates of the Festivals due to the Diaspora (scattering of Jews worldwide), which calendar was established around 360 A.D. by Rabbi Hillel II hundreds of years after the prophet Daniel and John of Revelation penned the various timelines--and, some 1,630 years before the connection was made in 1992/93. We understand the fulfillment of God's appointed times is in His hands. We have been given many supernatural signs. The four tetrad blood moons that ended at Sukkot in 2015 is likely a marker for the seven years that will end at Sukkot in 2022, There has also been the Shemitah year, the Jubilee cycles and global events, all pointing to the upcoming Festival cycle as a significant watch period. However, we don't know God's timing; any match of The Kingdom Calendar to world events and the beginning of the end would be ordained by Almighty God as a gift of "wisdom to the wise"... from an all-knowing Father who "reveals deep and hidden things" (Daniel 2:22). God will reveal and fulfill His appointed times according to His divine purposes and on the schedule of His choosing, and through the means of His own divine will. As mentioned, The Kingdom Calendar may represent a "pattern" or "template" of events, and therefore events may not fall exactly on the Festival schedule. The Jerusalem event could occur on any given day, on any given month... then, the counting would begin. On the other hand, God may have already chosen the Jerusalem disaster to occur exactly at Purim/Shushan Purim, just as the Calendar shows. Either way we can have confidence that the return of Messiah is tied to the fall Festival season, just as the spring Festivals were fulfilled during Messiah's crucifixion week and at Pentecost. God can change times; as He controls the earth, sun and the moon, and His times and seasons. We are told, there will be a "sudden" and unexpected Day of the LORD event for those who are not looking or expecting His return: “I will send My messenger [Elijah, the anointed one, or 1,260 days], who will prepare the way before Me. Then suddenly the Lord you are seeking will come to His temple; the Messenger of the Covenant, whom you desire, will come,” says the Lord Almighty. But who can endure the Day of His coming [down]?" Malachi 3:1-2. Therefore, we can be assured the Jerusalem earthquake will truly come to pass, when because of ruin and devastation daily worship is taken away at the Western Wall and Temple Mount. God's prophetic counting periods will then begin--providing wise students of the Word divine dates of end-time disaster and deliverance. Messiah's sworn promise to the final generation is that He will open the minds of those who seek wisdom from God and His inspired prophecies (Daniel 12:9-10). With the devastation in Jerusalem and the daily worship at the Western Wall and Temple Mount taken away, this will also coincide or initiate the prophetic war foretold in Daniel 8, when Donald Trump and the West takes on Iran (Persia/Elam), and Israel her neighbors. And, when Israel's citizens are shattered from the Jerusalem disaster, the wise will begin counting, day by day; and, the counting days will most certainly end on schedule and with amazing accuracy. God will not lead us astray, my friends. God's Word reveals His yearly Festivals established around the 15th century BC at Mt. Sinai and recorded in Leviticus 23, followed by the annual Fasts in Zechariah 8:19 established around the 6th century BC with the destruction of the First Temple and the Babylonian exile. The annual Purim celebration began in the 4th century BC, as recorded in Esther 9:1,17, 22. Then we add the prophetic counting periods recorded the books of Daniel (5th century BC) and Revelation (1st century AD). As shown, these very specific counting periods in Daniel are the "seventy 'sevens'"--490 days, with it's two 3 1/2 day periods of the last week; "2300 evenings and mornings"--1150 days; "time, times and a half"--1260 days; 1290 days; and 1335 days; and, the seven-time repeated 1260 days in the books of Daniel and Revelation, known also as "42 months" and "time, times and a half". The pivotal three and one half (3 1/2) days that are essential for The Kingdom Calendar to align just before the Day of Atonement (Yom Kippur) are repeated in Daniel 9:27 and Revelation 11:7-12. We add the Festival Calendar Hillel II established during the 4th century AD, hundreds of years after the books of Daniel and Revelation were written, which Festival schedule is still in use today by Judaism and other Festival celebrants. Now, all these factors, spread out over two millennia, have miraculously intersected between God and man to bring about The Kingdom Calendar. It reveals the timing of modern-day events centered on Israel, Jerusalem and the epicenter of prophecy--the Temple Mount. BOOK OFFER #2: Insights in Prophecy: Unlock The Ancient Mysteries of Daniel & Revelation is 342 pages--an 8.5X11" paperback compilation of 30 lesson guides that will take you step by step through Messiah's ancient prophecies of Daniel and Revelation, explaining how events in our world are matching with alarming accuracy.. The books of Daniel and Revelation predict end-time catastrophes and global upheaval, which is confirmed by Jesus in the Gospel accounts; but, many questions remain. How close are we to the appointed time written about by the Hebrew prophets? Are we the last generation? How will the ancient last-day prophecies play out in modern times? These questions and many others can be answered by looking at the prophecies from a fresh perspective. It’s commonly held that Daniel’s visions relate mainly to kings, wars and events of history past, and his predictions have little relevance to our world. However, the overlapping similarities between Daniel's visions and time periods, and the events and timelines in the book of Revelation, clearly show they are related. By uniting the prophecies of these two books into one, a bold new understanding can be unleashed of just how human history, as we know it, will end abruptly.The Insights in Prophecy 30 lesson guides will take you step by step through the books of Daniel and Revelation, showing how they relate to one another. In the process, we will research thought-provoking questions, offering Biblical commentary on the various aspects of God’s unfolding plan, which lead up to Yeshua our Messiah’s return and His Eternal Kingdom. To learn more, visit Amazon. 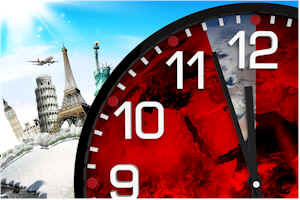 The "times and the seasons" are directly linked to the end of the world, and God has provided very "specific" and "to the day" counting timelines in the books of Daniel and Revelation for the final unfolding of His redemptive plan. Why? So that God's people may know where we are in prophetic time during the middle of the greatest turmoil in human history--in death, sorrow and crying, realizing by faith that our Messiah has a plan and His redemption is forthcoming. However, we still cannot know the actual "day or the hour" of Messiah's visual return at Armageddon. Jesus said He would cut short the great tribulation--"for the sake of the elect those days will be shortened," Matthew 24:22; for this reason, in the global turmoil brought on by the trumpet blasts and vial plagues, when the sun and moon are darkened, the day and hour of Messiah's visible return is unknown. Nonetheless, we can know the times and the seasons, for no matter which futurist prophetic view you hold there is always a timeline involved--whether a seven year period, or a three and one-half year counting period. Therefore, once final events begin, we can know the general time of God's judgment and return. The "thief in the night" terminology in the Scriptures is not a reference to a secret rapture of the church; it is a reference to the final destruction of the wicked who cannot escape God's wrath, which the KING of Kings will inflict at His triumphant visible arrival on the world scene at Armageddon. Paul confirms the holy people should not be surprised by the Day of the LORD, which to the wicked will come as a thief in the night... for they are not watching for it. On the other hand, Paul states that searching believers "are not in darkness so that this Day [of the LORD] should surprise" them like a thief. We are to be children of light, awake and sober... looking and watching. The Day of the LORD will not surprise the watching people of God, who are counting, day by day, the very specific numbered days of Daniel and Revelation. "Now, brothers and sisters, about times and dates we do not need to write to you, for you know very well that the Day of the LORD will come like a thief in the night. While people are saying, “Peace and safety,” destruction will come on them suddenly, as labor pains on a pregnant woman, and they will not escape. But you, brothers and sisters, are not in darkness so that this Day should surprise you like a thief. You are all children of the light and children of the day. We do not belong to the night or to the darkness. So then, let us not be like others, who are asleep, but let us be awake and sober," 1 Thessalonians 5:1-5. If you believe the timelines of prophecy will always be locked away, never to be understood... I challenge you to consider this: "Why would God expose very precise prophetic counting periods in the Scriptures, if they were not for the benefit of the last-day believers and the counting of God's prophetic time?" The last generation of overcomers who face final events are promised an increase in prophetic knowledge, and an understanding of how events will transpire by what the Scriptures call the final "unsealing" (Daniel 12:4). Daniel 12:10-12 adds, "Many will be purified, made spotless and refined, but the wicked will continue to be wicked. None of the wicked will understand, but those who are wise will understand." And, what will the wise understand according to the verse that follows? "From the time that the daily... is abolished and the abomination that causes desolation is set up, there will be 1,290 [counting] days. Blessed is the one who waits for and reaches the end of the 1,335 [counting] days." The promise is clear: the wise will understand what the 1,290 and 1,335 days represent. And, the watching believers ("those who keep God’s commands [the obedient] and hold fast their testimony about Jesus" Revelation 12:17) are promised a blessing for waiting patiently by faith through the days of trial to reach the end (Matthew 24:9-13; Isaiah 25:9), whether by waiting alive patiently or by resurrection, having given their lives in martyrdom. The case for these truths rests on the Biblical evidence and common sense. God revealed His prophetic counting times, for the day would come when these periods must be understood during the days of their fulfillment. Daniel understood the power of God to reveal important details concerning His final plans to those with wise and discerning spirits; he wrote, "Praise be to the name of God for ever and ever; wisdom and power are His. He changes times and seasons; He deposes kings and raises up others. He gives wisdom to the wise and knowledge to the discerning. He reveals deep and hidden things," Daniel 2:20-22. Wisdom says, "I don't understand all I need to know, nor did our church fathers of ages past who have come and gone; nor does the leaders of my church or synagogue. I have more to learn from God's Word." Discernment says, "I will trust God to show me His unfolding mysteries that have been hidden since the foundation of the world, because God promises that "when He, the Spirit of truth, comes, He will guide you into all the truth. He will not speak on His own; He will speak only what He hears, and He will tell you what is yet to come," John 16:13. If you must, put your minister, priest, church theologian or rabbi to the test: ask him/her what the 1,290 days and 1,335 days of the Daniel 12 prophecy reveal about God's final plan for mankind. The timelines were so important to God that He revealed them through His prophet Daniel for the knowledge of last-day believers, well in advance of their fulfillment. Can your spiritual leader tell you why they were written down, and how these prophetic days will be fulfilled in the future? Or, if you hold the Historicist view--as do Seventh-day Adventists and others, or you believe the Preterist view promoted by men such as Hank Hanegraaff--the Bible Answer Man, can he/she explain how the timelines were fulfilled in past history (although God's Word clearly says the time periods would be understood at the time of the end during the final days of trial)? The unsealing of these timeframes has been promised by Almighty God in Daniel 12. It's time we pay attention! As followers of Yeshua--Jesus our Messiah, we all need to study the Scriptures with an open mind, understanding the Spirit of truth to be our source of inspiration and wisdom. No human can boast of full knowledge and a complete understanding of the mysteries of the Ancient of Days. I certainly cannot! "Who has been [God's] counselor?" (Romans 11:34; Isaiah 40:13). However, the "wise will understand," Messiah's prophetic plan; and, He does not lie. Although veiled in ancient mysteries, Heaven's penetrating beam is shining brighter on the prophetic roadmap that will lead His believing victors through the final trial, for the shadow of things to come is about to meet reality (Colossians 2:16-17). There is no excuse for God's people. Final events and Messiah's return need not surprise us like a thief in the night. However, most will be shocked and unprepared for the devastation and unfolding of prophetic events long foretold in the Hebrew Scriptures that will begin in the Middle East with devastation and war, which will mushroom in nuclear tragedy and untold human loss across the globe with lightning speed. Now is not the time to be wavering in our faith; we must trust all the more in our Messiah and His unfolding plan--which was first written in the Book of Truth before time began (Daniel 10:21; Psalm 139:16). We must trust in His salvation, praying for the Holy Spirit to guide us moment by moment. Stand firm in faith my friends, for troubles will increase as the testing time explodes upon us... including deep personal losses, affliction and betrayal by family and friends, even death. Are you ready to face martyrdom for your Messiah and LORD, if need be? "For we are made partakers of Christ, if we hold the beginning of our confidence steadfast unto the end; While it is said, To day if ye will hear His voice, harden not your hearts," Hebrews 3:14-16. Jesus also said because hearts and former relationships will grow cold: "They [will] deliver you up to be afflicted, and shall kill you: and ye shall be hated of all nations for My Name's sake... But he that shall endure unto the end, the same shall be saved. And this gospel of the kingdom shall be preached in all the world for a witness unto all nations; and then shall the end come," Matthew 24:9, 13-14. The King is returning, and the Kingdom of God is at hand. The mighty hand of God will be seen in this world as Satan makes his last stand to hold onto global power through his evil leaders--Antichrist and the False Prophet, and their deceptive signs and wonders. God is attempting through His Festival Calendar to give us focused attention to His final plan of redemption. From leaders to laypeople, those willing to take on the heart of a student, who are willing to dedicate minds to open and sincere study, can understand where the world is headed. Yeshua first instituted the Biblical Calendar of annual Festivals through Moses (Leviticus 23), which included the yearly counting of days and weeks, so that His people might rehearse His Passover death and resurrection, the Pentecost (Shavuot) power of the Holy Spirit, and finally end-time events leading up to the Day of the LORD. To the annual Festivals, He added the Sabbath Year--the counting of seven years, when the land was to rest every 7th year as a (Shemitah) Sabbath. But, He did not stop there. God added the seven cycles of Sabbath/Shemitah Years (Exodus 23:10-11), when the Israelites were to release and return the land to each rightful owner--known as the Jubilee Year--all signs of things to come. Now, God's final plan of redemption is at hand as seen through the very precise counting days of Daniel and Revelation (3 1/2 days; 490 days; 1,150 days; 1,260 days, 1,290 days; 1,335 days). These counting days will be a guide to those who by faith are willing to follow Jesus to the end through the great trial, starting with the release of the Temple Mount from the power of Islam--a time of great shaking, both physically and spiritually. Specifically, over the last 100 years the world has been quietly marching around the sun spinning towards the appointed time God ordain from before the beginning of time. Now, the clock sits just before midnight and the world at large is about to explode into chaos and turmoil beyond the faculty of mind to fully imagine, but which tomorrow we will surely face. From the conception of the future state of Israel found in the Balfour Declaration delivered on November 2, 1917 we can add 100 full years; this takes us to November 2, 2018. From the retaking of the Western Wall in June of 1967 during the Six-Day War, we can add 50 full years; this takes us to June 2018. When we consider the momentous day Israel became a nation again on May 14, 1948 we discover the 70th year runs from May 14, 2018 to May 14, 2019. 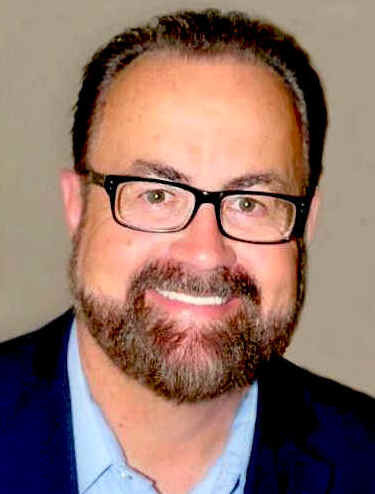 All these time periods point to the years 2018 to 2019 as being the "years of focus", with early 2019 as the culminating period that completes Israel's 70th full year--the timeframe that could very well usher in Jerusalem's devastation, World War and the starting point of the counting periods of Bible prophecy. The rebirth of the nation of Israel and the epicenter of Bible prophecy--the Temple Mount is the focus of the Hebrew prophets and their ancient prophecies. Jerusalem's upcoming destruction will lead to the eventual rebuilding of Jerusalem in times of trouble, with at least part of the third temple structures restored. Sadly, this restoration will pave the way for Antichrist to step onto the Temple Mount and to set up his abominable idol that will usher in God's trumpet and vial wrath and Armageddon. God promised, “In those [last] days and at that time [appointed], when I restore the fortunes of Judah [the Promised Land, Western Wall and Temple Mount] and Jerusalem [back to the people of Israel], I will gather all nations and bring them down to the Valley of Jehoshaphat [for the battle of Armageddon]. There I will put them on trial for what they did to My inheritance, My people Israel, because they scattered My people among the nations and divided up My land," Joel 3:1-2. The Festival dates below are from Jewish sources. All Biblical holidays begin at sundown on the evening before the date shown. On holidays marked "*" strict observers do not work. Festivals and dates in "BOLD" represent the next watch period of The Kingdom Calendar above.